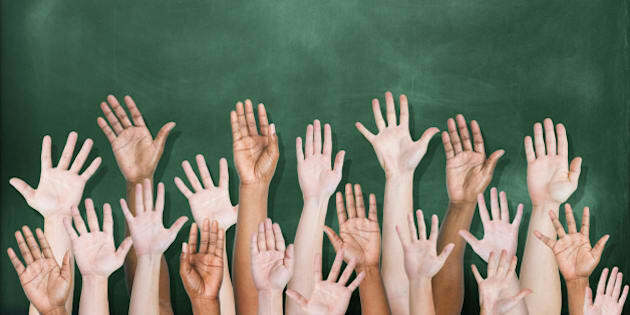 A multi-ethnic group of students' hands raised in front of a classroom blackboard. There are 18 hands raised, visible to the wrist or elbow, and seen from the side of the palm. The blackboard is dark green and has been freshly erased. It is widely known that disadvantaged children perform dramatically lower on cognitive achievement tests than children from well-to-do families. In Toronto, for example, children from family homes earning less that $30,000 per year (disproportionately single moms), perform more than 30 points lower on test scores in reading, writing and mathematics, compared to children coming from homes with over $100,000 family income, on the EQAO provincial tests. We know what the problem is. We even know what to do about it. But do we have the political will? As Canada plans for investment of billions of dollars in infrastructure, it is worth noting that James Heckman (Heckman Equation), Nobel laureate in economics of human development, has shown that infrastructure has only a one to two per cent rate of return while investing in pre-school disadvantaged children has a proven record of yielding an eight to 10 per cent rate of return. As McKinsey & Companypointed out, achievement gaps, in evidence from birth, are "the equivalent of a permanent national recession." Children who participated in the early childhood projects during the 1960 and 70s, called the Perry Preschool Project and the Abecedarian Project have been followed intensively now for up to 40 years and the results are powerful and instructive. They offer a bright beacon of light on narrowing the inequality gap and reducing child poverty. Early childhood education delivered to disadvantaged children as young as one to four clearly promotes economic efficiencies and reduces lifetime inequalities. In 1972, in North Carolina, the Abecedarian Project conducted a controlled experiment with 111 randomly selected disadvantaged high risk children, who were born between 1972-77, starting from infancy to age five. Ninety-eight per cent were Afro-American children. The 57 children were given a high quality education including important home visits focusing not only cognitive skills but socio-emotional soft skills such as: perseverance, motivation, risk-aversion, self-esteem, self-control. The important home visits by social workers and teachers impacted on the lives of parents that made positive permanent changes in the home environment that affected their children for years long after the program ended. The lessons from this study of 57 children are remarkable. While the early IQ gains found in the Perry Preschool project evened out after four years (though the gains in achievement scores were maintained at age 14), the IQ gains from the earlier and more intensive Abecedarian project, carried on into adulthood. While cognitive skills were important to both programs, socio-emotional development was central and key. Achievement tests do not adequately capture socio-emotional character skills. As James Heckman points out, socio-emotional skills have a 27 per cent life time earning impact, while cognitive test scores have only a seven per cent impact on life time earnings. Achievement test scores predict only a small fraction of the variance in later-life success. For example, adolescent achievement test scores only explain about 15 per cent of the variance in later-life earnings. By the time children start kindergarten, those born into poverty are already at risk of dropping out of school, crime, and a lifetime of low-wage work. The Abecedarian Project produced a phenomenal 10 per cent rate of return on investment compared to a standard 5.8 per cent average rate of return on investing in stocks. Recently researchers at Duke University published a study that looked at what happened to five-year-old students, 13 to 19 years after they left kindergarten. The five-point teacher-rated social competence scale used was a powerful predictor of both positive and negative future outcomes in education attainment, employment achievement, criminal justice, substance use and mental health. These studies, demonstrate that an early intervention for children in disadvantaged homes, focussing on these soft skills, have a direct positive effect on wages, schooling, teenage pregnancy, smoking, crime, performance on achievement tests, including a wide range of health factors and health choices. They are healthier, and make better life style choices. Both the Perry Preschool Project and Abecedarian Project reduced participation in a variety of social pathologies. By the time children start kindergarten, those born into poverty are already at risk of dropping out of school, crime, and a lifetime of low-wage work. This is not only bad for all those born into poverty by the accident birth, and bad for society. Common intervention programs offered by many government organizations such as adult literacy, job training, or prisoner rehab programs all have far lower rates of return. As well, no other remediation programs for older students come close to the returns from investment in preschool children. A recent revised report of cost benefit from 40 years of data for the Perry Preschool showed that $15, 895 spent for every child in the Perry Preschool Project saved $138,486 in social costs, for every dollar invested, a return of $8.74 at age 27, and over $14.00 at age 40. Within the targeted population, among many other outcomes, there was a pronounced reduction in crime, obesity, and heart disease. Investing in disadvantaged pre-school children can dramatically raise tens of thousands of children out of poverty, narrowing the income gap, and giving thousands of marginalized children, born poor by the accident of birth, an equal opportunity to thrive and succeed in our society. It's part of a necessary anti-poverty pro-equality strategy that's good for kids and good for all of us.